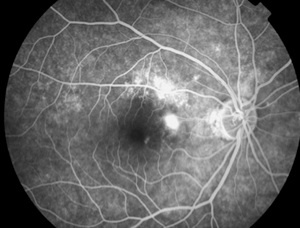 Retinitis centralis serosa in Oogaandoeningen bij OptiekPedia, klik hier! Central serous chorioretinopathy is a retinal disorder which affects the macula. It was first described in ophthalmology more than one hundred years ago. Essentially, it is an "idiopathic disorder" which means that the precise cause is unknown. Central serous is associated with an elevation (detachment) of the macula due to leakage of fluid from the circulation behind it (choroidal circulation).